Love your Family. Love your neighborhood. Love your bike. It’s an event unlike any other. We will celebrate the difference the complete street improvements have made to families in their daily lives. The City of Redding, Shasta Safe Routes to School Program, and Sequoia School worked together to identify needed safety improvements and activities. People from other parts of the community will have an opportunity to come and see for themselves and learn about Shasta Safe Routes to School activities throughout the county and think about ways they can improve safety and convenience and the ability for their own children to get around. 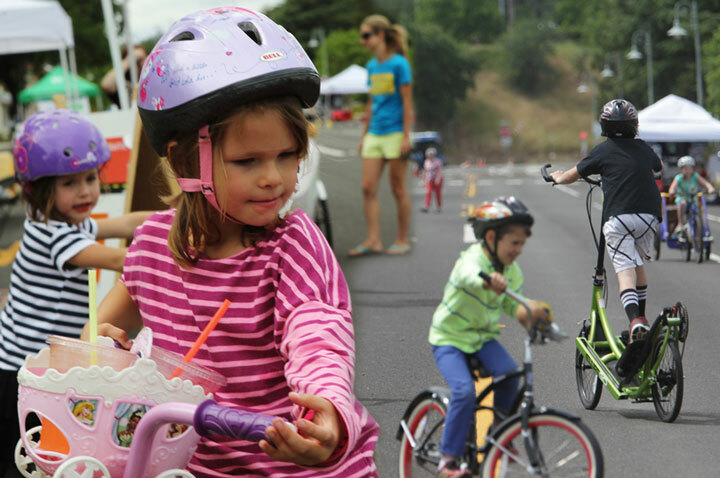 To create this free public event, Shasta Living Streets and Shasta Safe Routes to School partner and work to engage businesses and community groups from across the county to come and participate. We are putting a team together now. On this day a stretch of downtown Redding is transformed into a car-free zone for Sunday enjoyment. Family, friends and neighbors meet and experience downtown in a new way. Area residents learn about businesses and neighborhood attractions previously unexplored. People see their downtown district from a new perspective. This is an inside-out parade, where people themselves are the parade, participating in activities and enjoying a walk or ride on a beautiful spring Sunday – local restaurants and shops are the attractions. Come out and celebrate what’s best about our community, supporting business and enjoying our beautiful city. It’s a free-form parade where everyone participates. And it’s not just for bicycles! The open-street makes it fun and safe to walk, skip, skate, dance and bicycle along California Street. “Thank you. I’ve been riding my bicycle around town for the first time in years since your event” said Jon Lewis. Safe Streets. Rader Excavating is the professional team that puts together the traffic plan in cooperation with city officials, and works all day to manage traffic and keep participants safe. Redding, CA is part of a worldwide movement – 100 cities worldwide produce open street events. Thousands of people have enjoyed the program in Redding for the past five years. Redding is not the biggest – but we were one of the first! Our Inspiration. Members of Shasta Living Streets were inspired by the Ciclovías of Bogotá, Colombia that make car-free space available to everyone, connecting neighborhoods each Sunday for 70 miles across the city. We are inspired by Gil Penulosa who produced those events and now leads an organization that helps cities worldwide: 8-80 Cities promotes walking and bicycling as activities and urban parks, trails, and other public spaces as great places for all. Watch this video to learn more The Rise of Open Streets. Remember – Redding may not be the biggest – but we were one of the first! Shasta Living Streets is now part of a research project by 8-80 Cities and Washington University. Anne attended the Open Streets National Summit in Los Angeles, April 6-8, 2014 representing Redding and Shasta Living Streets. Better Bikeways Campaign: Instagram site. Hundreds of photos of attendees. Ciclovia event will turn Parkview Avenue into giant bike lane. Support –Join or renew today!